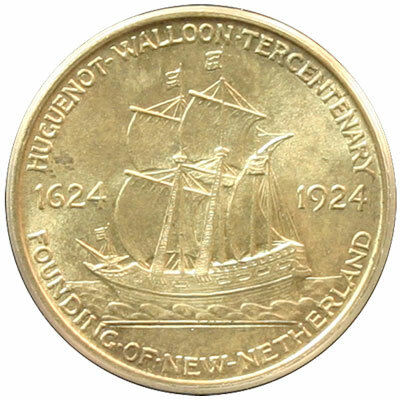 In 1923, the 67th Congress approved the Huguenot-Walloon Tercentenary Half Dollar classic commemorative coin to recognize the 300th anniversary of the Dutch Colonists settling in New Netherland, now known as New York. The 67th Congress approved, "An act to authorize the coinage of 50-cent pieces in commemoration of the three hundredth anniversary of the settling of New Netherland, the Middle States, in 1624, by Walloons, French and Belgian Huguenots, under the Dutch West India Company." When approved on February 26, 1923, this Act became noted as Public Law 67-440. The law allowed, "...there shall be coined at the mints of the United States silver 50-cent pieces to the number of three hundred thousand, such 50-cent pieces to be of the standard troy weight, composition, diameter, device, and design as shall be fixed by the Director of the Mint, with the approval of the Secretary of the Treasury, which said 50-cent pieces shall be legal tender in any payment to the amount of their face value." The law included the Proviso: "That the United States shall not be subject to the expense of making the necessary dies and other preparations for this coinage." This law added a section stating "That the coins herein authorized shall be issued only upon the request of the Fifth National Bank of New York, and upon payment of the par value of such coins by such bank to the United States Treasury." The coin's estimated value ranges from $90 (low grade - XF) to $625 (high grade - MS-66). Extraordinary characteristics on the Huguenot-Walloon Tercentenary Half Dollar can command a price outside the estimated value range. 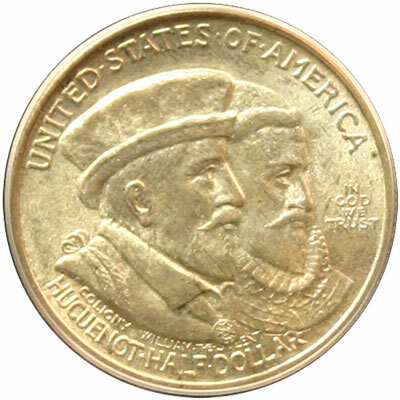 The obverse or front of the coin includes the profiles of two men. One is Admiral Coligny and the other is William the Silent. Both men were leaders in the struggle for civil and religious liberty. The coinage inscriptions say, United States of America, Huguenot Half Dollar, In God We Trust, and Coligny–William the Silent. The reverse or back of the coin includes an image of the Nieuw Nederland with its flags flying atop its masts and its sails full of wind. The refugees sailed the ship to the New World. The coinage inscriptions say, Huguenot-Walloon Tercentenary, Founding of New Netherland, and 1624-1924. Though the stated mintage was 300,000, records show just over 142,000 were distributed. The gentlemen portrayed on the front of the coin were not alive when the colonists set out for the New World. Admiral Coligny, the gentleman on the left, lived from February 1519 to August 1572 and is best known as a Huguenot leader in the French Wars of Religion. William the Silent on the right lived from April 1533 to July 1584. He is the ancestor of the monarchy of the Netherlands. In the Netherlands, William is known as the Vader des Vaderlands, "Father of the Fatherland." Queen Wilhelmina of Holland, King Albert of Belgium and President Millerand of France joined the celebrations with President Coolidge. Those countries also held celebrations to observe the anniversary. Prior to the festivities in New York, Jacksonville and Mayport, Florida along with Charleston, South Carolina held ceremonies to remember their Huguenot colonization in 1562. Visit our GACS Numismatic Shoppe Huguenot-Walloon Tercentenary for a variety of useful items decorated with images of the classic commemorative silver half dollar coin.